Dolph Ziggler vs Kevin Owens and AJ Styles vs Baron Corbin headline a rather dull edition of SmackDown Live, three Fastlane title matches are announced, Ruby Riott pins somebody, Gable & Benjamin are screwed again, and Jinder Mahal’s exposé of Bobby Roode’s Top 10 leads to problems with Randy Orton. 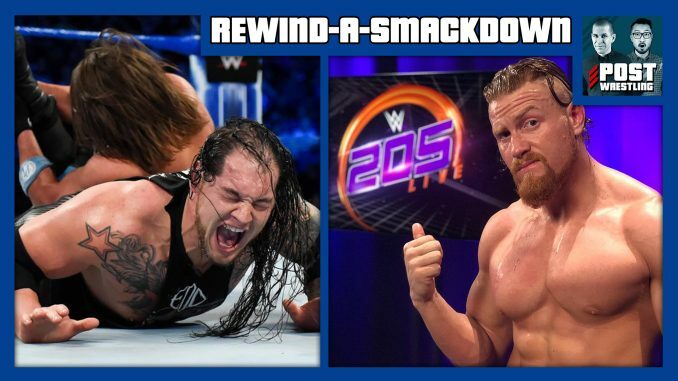 Buddy Murphy makes his cruiserweight debut against Ariya Daivari, while Mustapha Ali takes on a reformed Jack Gallagher in another Tuesday-saving edition of 205 Live. Charlotte/Bobby Roode vs Nia/Apollo in Week 6 of the Mixed Match Challenge.